Starbucks, in partnership with the Society of Interpreters for the Deaf (SID), developed the Outreach Community Program to enhance Deaf livelihood and enrich customers through a series of free workshops held throughout the year at Starbucks Bangsar Village II. There are currently three types of workshops within the program: the Personal and Professional Development Workshop, the Deaf Empowerment and Awareness for Youth workshop, and the Signing Workshop. All of these workshops target to benefit 840 people in Malaysia every year. These workshops hope to help the Deaf community develop their soft skills to prepare them for employment, and to also provide free Sign Language Classes for the public so that customers can learn to communicate with the deaf and understand deaf culture. These sign language classes, or Signing Workshops, are held six times every quarter. Syllabus within these workshops include common sign language such as everyday expressions, action words, people and relationships, food and beverages, and many others. In addition to the Signing Workshop, there is also the Deaf Empowerment and Awareness for Youth Workshop which engages youth from deaf schools and institutions on life saving and financial tips, including topics related to Cybercrime, Introduction to Financial Planning and SAVEME 999 Deaf. Meanwhile, the Personal and Professional Development Workshop helps the deaf community develop soft skills, such as work ethics, teamwork and career attributes including professional writing, coding and web development, amongst others, to help the deaf community prepare for employment. This interactive learning experience provided through these workshops brings together Starbucks partners (employees), persons who are deaf and hard of hearing, the neighborhood community, individuals and many more to learn more about sign language. Through these signing workshops, the mission of being performance driven through the lens of humanity resonates strongly at the Starbucks Signing Store as it empowers the Deaf and Hard of Hearing Community an opportunity of equal rights and access to information and communication. 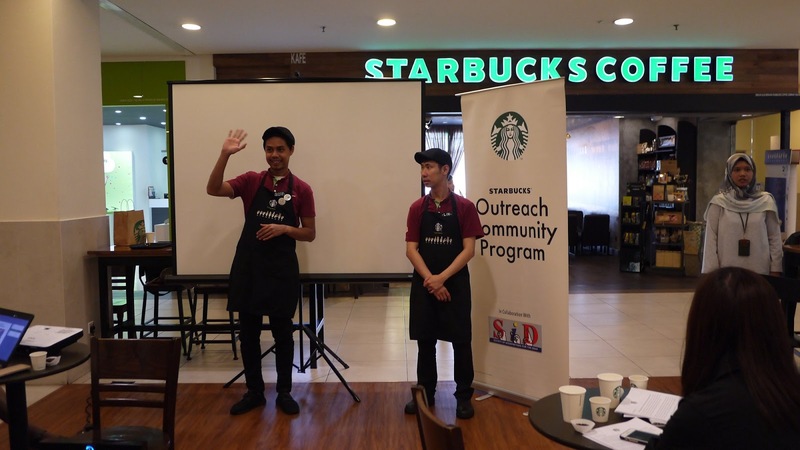 Besides conventional retail training, Starbucks Deaf partners can further develop their coffee passion and knowledge through the Coffee Master certification program. Upon being certified as a coffee master, not only are they honored with a black apron that features a special embroidery with ‘Starbucks’ in Malaysian Sign Language, but it also enhances their career track. 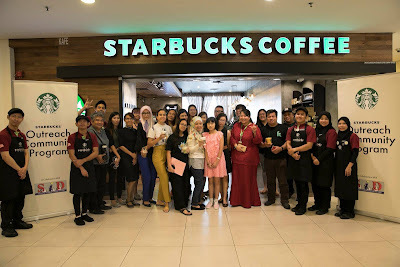 In August 2018, Starbucks Malaysia has certified eight Deaf coffee masters in Malaysia and aside from being the first Starbucks Signing Store in the world, it is also the first Starbucks Signing Store that houses 100% certified coffee masters. Inside the Starbucks Signing Store, customers will be familiar with what they see and smell: the rich aroma of the finest Arabica coffee, served by partners in the iconic green aprons in a warm, bustling environment. 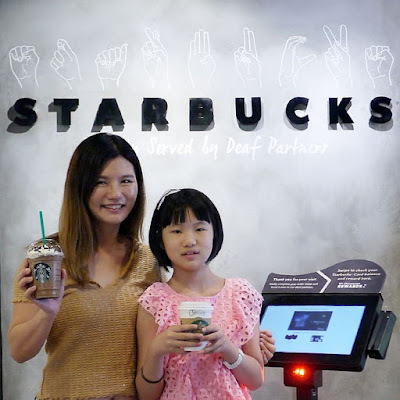 But while Deaf partners engage with customers with the enthusiasm, passion and craft that they expect from Starbucks, they deliver the iconic Starbucks Experience in a uniquely uplifting way. When customers go to order, they will notice something different, as the usual greeting and sound of baristas calling out beverage orders is replaced by sign language. Customers place orders using a simple menu card which they mark before passing it to the barista and Deaf partners use handwritten notes to communicate with customers. Upon placing the order, each customer is given a number on the receipt and once the beverage has been prepared, the number is displayed on a screen telling them it’s ready. If you would like to participate in a signing workshop, kindly email wonder@sid.org.my to sign up. For more information, please visit the Starbucks Malaysia website at www.starbucks.com.my.